Whether you plan to make your attic better insulated or use new and better insulating material for the walls of your house, we can help. At the first phase of the project we’ll inspect the structure thoroughly and discuss the insulation options which are suitable for it. We provide an honest and detailed evaluation of each insulating material based on R-value, resistance to different types of damage, safety and environmental impact. 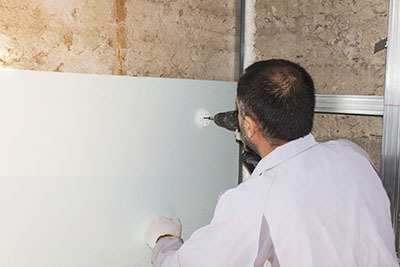 Before installing the insulation, we seal any air leaks which can bring down its effectiveness. This is the equivalent of air duct seal repair when you want to improve the energy efficiency of your HVAC system. The key to proper installation is to fill the whole area without leaving any gaps or compressing the material, which would bring its R-value down. Around 25% of the heat in a house literally flies out the roof. To reduce this major heat loss, you will need the ceiling to be properly insulated. Unless you plan to use the attic for living or storage, you can choose from a wide array of materials. Blankets are among the most popular options, followed by loose fill and sprayed foam. Quite often, homeowners choose more than one material to ensure that there are no gaps where air could pass. As part of our insulation services, we will calculate the required amount of material accurately to keep costs under control. Keep in mind that in order for the insulation to give the highest possible R-value to the ceiling, it should go above the joists. This is what we strive to achieve. When we take up such a project, we study the floor’s structure in detail to determine what type of insulation will be best for it. Among the most popular options with homeowners are foam boards and blankets. When it comes to the nature of the material, it should be highly resistant to moisture. During installation, we are extra careful to ensure that there are no insulation gaps around the pipes and air ducts which go through the floor. To hire our service today, give us at Air Duct Cleaning Woodland Hills a call!